In 1880, Signac’s father died and his widowed mother decided to sell the family business and move from Montmartre to the quieter suburb of Asnières. 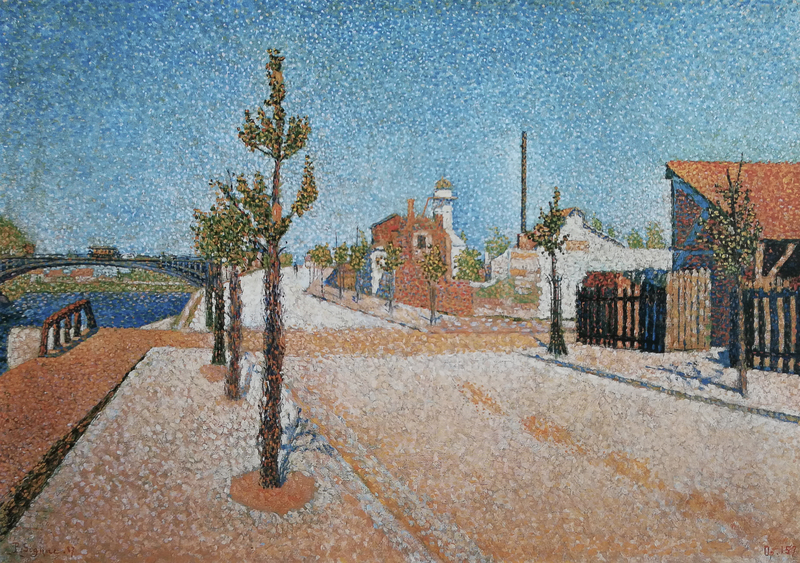 Signac was drawn to the semi-industrial areas adjoining his mother’s chosen district and regularly used this hinterland as inspiration for compositions using his neo-impressionist technique (such as Gas Tanks at Clichy now at the National Gallery of Victoria, Australia). Recent acquaintances Vincent van Gogh and Camille Pissarro joined him there. The painting is orientated downstream, with Asnières behind the viewer and the pont de Clichy, spanning the Seine, seen in the distance on the left. The trees, barely more than saplings, and the pristine state of the road underline the fact that this area has only recently been developed, adding to the semi-industrial ring of communes springing up on the outskirts of Paris. The predominantly orange palette of the lower half of the painting provides a perfect foil for the brilliant, pulsating blue of the sky, illustrating neo-impressionist theory regarding the optical effects resulting in the proximity of two colours originating from opposite sides of the colour wheel.